Colour work knitting is one I always find so much faster. It's not because it is any faster, by any means, but because I love it so much so I seem to do more knitting on it at once. I love seeing the picture evolve with every row, and so it's delightful to just keep on knitting to see what you end up with. This is my first time using a 4ply yarn in an intarsia design and I love it. It's coming up so very nicely, nicer than a design using a thicker yarn. Having a smaller ply means there's room for the picture to be more detailed. I've nearly finished the right front, with only the yoke left to knit. I realise colour work is something that can seem complicated to a lot of knitters. It's absolutely not, and is so much fun! 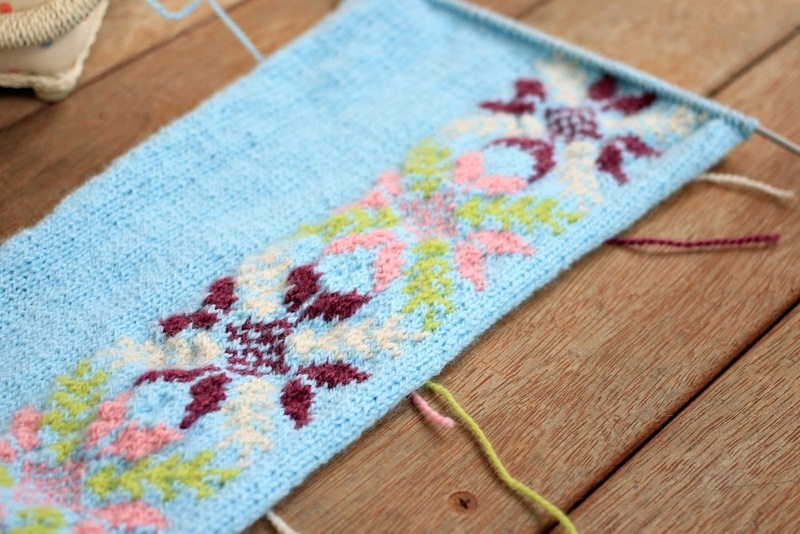 Today I thought I'd share my top four tips for knitting intarsia and fair isle designs. The first colour work project I ever made was the Mini Christmas Stocking Ornament by Little Cotton Rabbits. 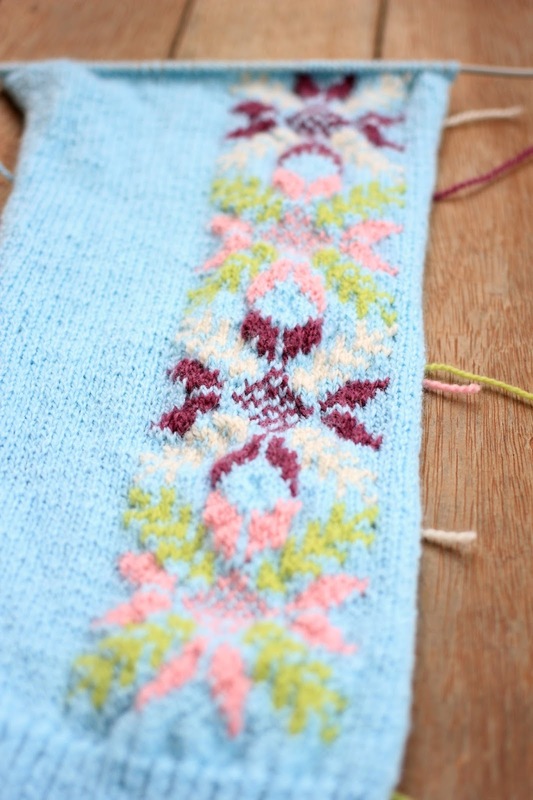 It was a small, quick design that was a wonderful introduction to fair isle knitting. It's designed for a 4ply yarn, but as it's an ornament you can make it in any size you like! Worked flat it's suitable for relatively new knitters, as I was when I made my first. I recommend picking a project that, like this one, doesn't have any shaping during the part where you're working the colour design. It's not hard by any means, but I think for your first go it's best to just be able to concentrate on the colour chart. Any of the Little Cotton Rabbits toys would be good introductions to colour work, as most of them feature it on their clothing. The patterns are classed as intermediate due to the shaping and techniques in the toy itself. This book has lots of different blocks in it, including fair isle and intarsia designs. A few blocks would make a lovely cushion cover or addition to a blanket, and are quick projects to complete, allowing you to try your hand at different levels of designs. My Fair Isle Flower Check Square is also suitable, and something like my Chevron Square is very simple, with a lovely result. You could even use the Chevron Square as a dishcloth as there aren't any long threads across the back, as the colour change is so frequent. If you're more experienced and comfortable working with DPNs, the Baa-able Hat is a fun intarsia design, and the sheep are worked on the part of the hat where no shaping occurs. Mug cosies are also a quick thing to knit that would serve as a good introduction to intarsia, suitable for any skill level. Fair Isle and Intarsia designs are usually represented on a chart. This isn't scary or complicated. It's simply a grid, with the picture on it. Each square of the grid represents one stitch, and each row represents one row. Charts can come with the stitches numbered across the bottom, and the number of the rows written up the sides. Charts are worked from the bottom-up. When knitting a design flat (on two needles), the chart is followed as such: the knit rows are worked from right to left. The purl rows are worked from left to right. It's as simple as that. To keep track of where you're up to on the chart, it's a good idea to put a tick next to the row after completion if you've printed the pattern out, or better yet get yourself a row counter (useful in all kinds of knitting!). Keeping track while you're working across the chart is as simple as counting. For example, if you're working a checked pattern, you'd count 2 white, 2 pink, 2 white, 2 pink, and so on. Carrying colours across the back of the work is something I put off learning. I thought it would be hard. Most 2 colour fair isle projects don't require you to carry colours, as the colour changes on the back of the work are very frequent, and so I hadn't needed to learn it yet. Then the day came when I was knitting a blanket square with a lovely colourful design that used around 5 colours. Between the rows and expanses of stitches where one of the colours wasn't used, I simply snipped it off and rejoined where it was required again. Then I finished the block, and I realised how many ends I had to darn in. Lots. That's when I decided that carrying colours can't be more tedious than darning in countless ends. As it turned out, carrying colours is so ridiculously simplistic I can't believe I put off learning it! I followed the instructions from this book, because I learn quite well from photo tutorials (it's under Weaving on page 98). I've done a quick google and couldn't find a video that didn't look over complicated, but I'm sure if you dug deeper you'd find one. I was considering putting together one myself, if anyone was interested. Yarn can look very different in a fair isle design than it does in it's ball. If you're not confident with choosing colours, sticking to classic combinations is a good idea, until you find your feet. White or cream is always a lovely coordinating colour that goes with practically everything. If you're using two colours of the same family - say two blues - hold a single strand of each yarn next to each other to make sure that they are contrasting enough to show up. Two colours of a similar shade worked together can make your design disappear. I hope you find these tips helpful! If you have any questions please leave them below and I'll do my best to help you, or you can also send an email. Project shown in this post is this one, the pattern and yarn details are in this blog post.